This is a battery-free, mechanical multirotation absolute sensor. With an analog clock, it is possible to know what time it is by looking at the positions of the hour hand, minute hand, and second hand. 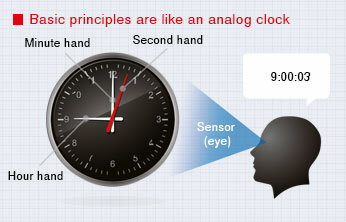 An ABZO sensor has four gears that correspond to the hands on a clock. The positions of these four gears are detected by the sensor, recognizing position information. 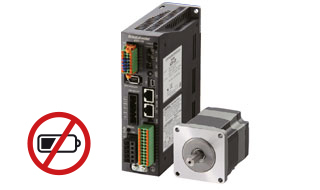 Absolute position detection is possible with 1800 rotations of the motor shaft from the home reference. By mechanically detecting these positions with the ABZO sensor, an absolute system is established in which position information can be retained even when the power supply is shut down. In addition, since the positions are detected mechanically, it no longer requires a battery that was needed to back up position information, and therefore, the position information will not be lost even if the motor cable is disconnected. A control method unique to Oriental Motor that combines the merits of both open loop control and closed loop control is used. These products use our closed loop control to maintain positioning operation even during abrupt load fluctuations and accelerations. The ABZO sensor monitors the rotation speed and amount. When an overload condition is detected, it will instantaneously regain control using the closed loop mode. When an overload condition continues it will output an alarm signal, thereby providing reliability equal to that of a servo motor.